What a fabulous experience! The Intensive study of 12 days with the Royal School of Needlework was magnificent. There were only 6 students in our Diploma course. Of the 6 only 3 of us completed our projects. And this year they added a day more than the previous 11 day Intensive study groups. I chose stumpwork. One of the guidelines limited the size of the figure - which could not be more than 4" high. 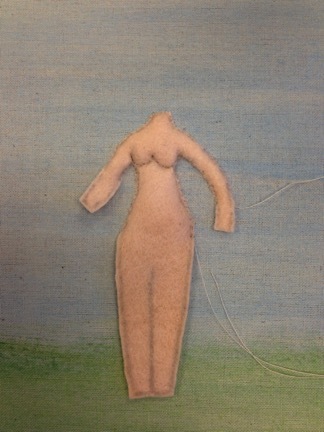 Working a stuffed head, making 2 hands with 5 fingers each, and clothing to fit over such a small piece was quite a challenge for one who has a few arthritis issues, strength in the fingers, etc. 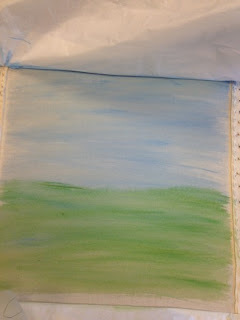 But all turned out well and I am thrilled that I had the opportunity to participate. My tutor had the distinct honor of working on Kathryn's wedding gown and William's christening gown. Mercy! Process: Get in as 1 of the 6; submit sketch of design for approval (must be 4" - 4"???? I can't see 4"); after approved plan trip; arrive; paint fabric (they call it calico I call it a heavy grade of muslin - very substantial - 24" x 24". - yes, 24" x 24" for 4" figure???? ); make a body and stuff appropriately; prepare 2 hands and they must be mounted so they are visible; add shoes (yes, they do actually look under the skirt!) 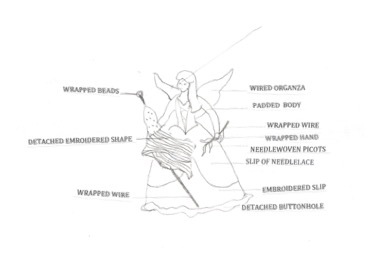 stitch a head with facial features; apply wire edge to skirt and needle lace the ruffle and attach to body; make needlelace slips off fabric and attach to design; various wire wrappings (flag pole and olive branch); wrap bead (flag pole top); appliqué (flag); needle laced leaves for olive branch; appliqué wings and couch accordingly; add pearls to sleeves then attach over stuffed body; needle lace vest; add hair. When all was said and done, we began wrapping to ship off for assessment. Mine was wrapping at 5:45 pm - doors closed at 6:00 pm. That's why the heading is PHEW! I noticed in pictures when I reviewed at home (after the fact of course) that something happened to her face and it lost it's fairly decent setting as shown in the photo above before the hair was added. Oh well. It is what it is! Great, great, great! Please adventure forth if you have the opportunity! Many modules to select from: silk shading, gold work, blackwork, cut work, canvas, Jacobean, and more. 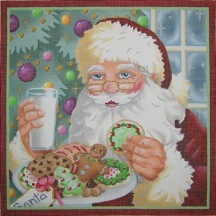 As classes move forward, we are preparing to post the first lesson for the Santa's Rewards project from Devon Nicholson. As a reminder, standard classes cover a 6-month period. One lesson is posted each month. Lessons are posted in a secret Facebook page to which paid participants are invited to join. 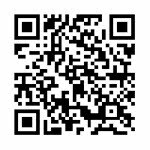 The 6-lesson packet is $150 and is invoiced through PayPal. There is still time to join us so if you'd like to take part just send me an email and we can take it from there. 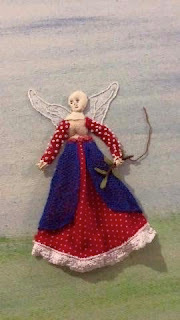 Monthly lessons will be posted on November 15 for Happy Haunting and Robin's Wreath as well. Registration is currently going on for these two fabulous trips: Have a Ball in Boston and Party on the Po. We are so excited about the response of these stitching trips and would love to have you join us. The group that has signed up so far appear to promise a great time for all. We have already been laughing and jabbing online and we haven't even met face to face! It will be super fun. Get more details over on our sister blog - www.needlesnfins.blogspot.com. Space is limited on these trips and we would hate to have you miss out. Also special deals, such as free airfare, will be expiring within the next week so check it out! Come on over. 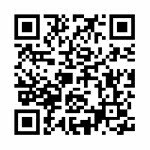 Email me with questions on any of the things I have shared with you! Have a great weekend and be sure to Stitch with a Smile! "Where everybody knows your name" . . . Does this ring any bells? 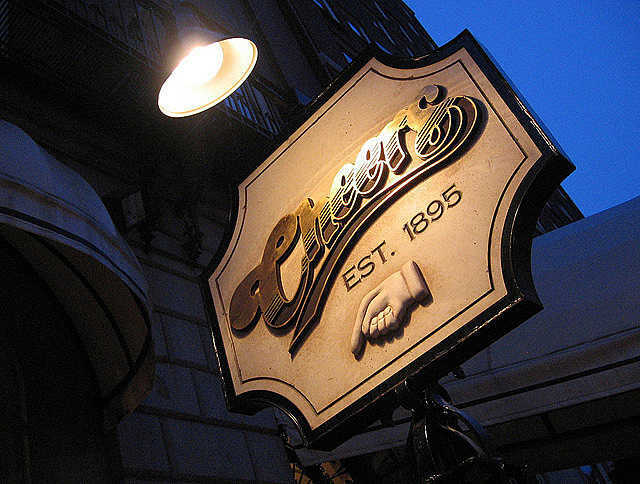 Remember the "Cheers" television program and the theme song "Cheers"? 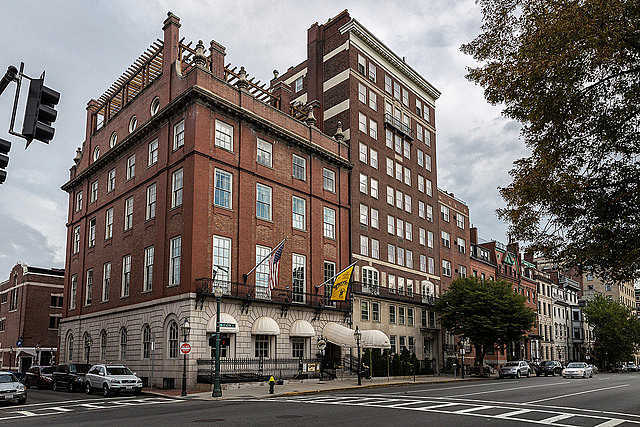 Well, we are going to have one fantastic luncheon on our 'HAVE A BALL IN BOSTON" tour! 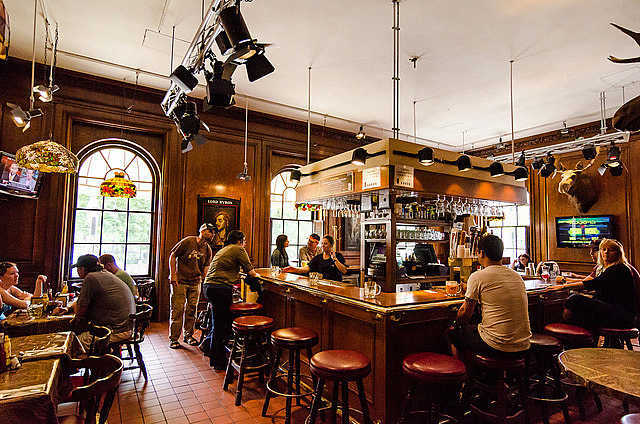 The information about the pub states that the original bar is nothing like that depicted on the popular TV show. However, the owner, in his wisdom, built a gift shop that has a replica of the one on the show. Our guide has a great lunch planned for us. Come join us for our day full of adventures when we roam the streets of Boston. 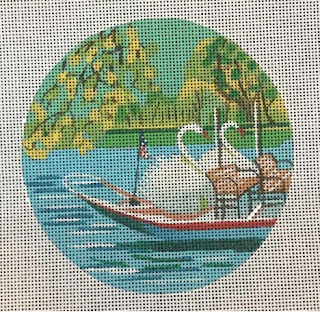 I'll be posting more about our adventures such as the needlepoint shops we will visit, the shopping that is available, the historic sites we will enjoy and did I mention stitching? Stitching? Stitching? Join us for this fun trip on June 8-13, 2017. Details are in the brochure posted in the older posts. Finalized the itinerary for our fantastic Boston/Cape Cod land tour. We are going to have the greatest time! June 8-13, 2017. We will be visiting 3 (get that? 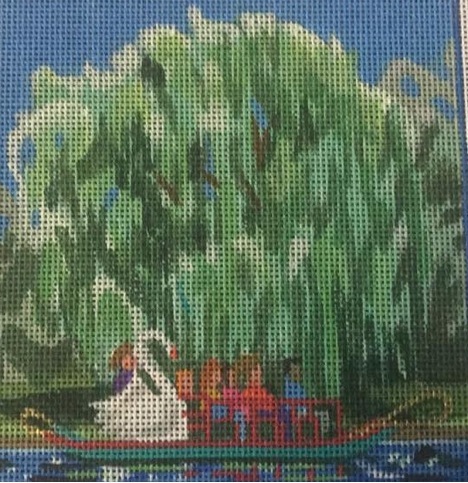 THREE) needlepoint shops on this 6 night-5 day tour. 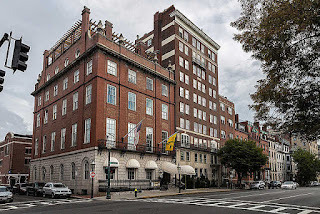 We leave from Logan International Airport and head to outer area of Boston to our Courtyard by Marriott Hotel in Woburn MA where those who drive will park their car and forget it for the whole trip. After we settle in and have our dinner we will have a mini-workshop doing an optional project to warm up. Then we start the serious stuff the next morning. 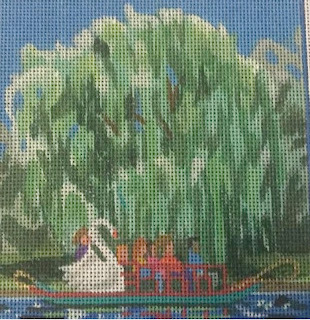 Jump on our fabulous coach and head for our first needlework adventure - Wellesley Needlepoint Shop. 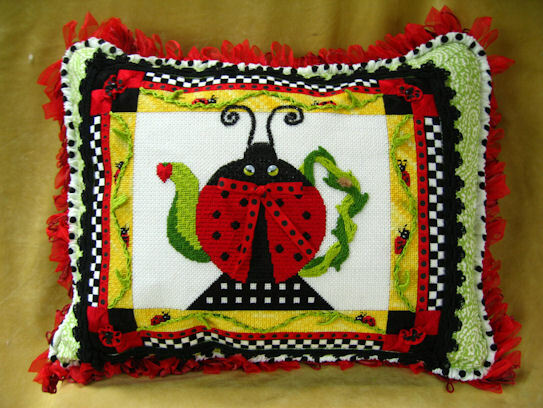 Wellesley Needlepoint Shop is a must-stop between your hotel and lunch destination! We will spend 3 glorious hours shopping or possibly taking part in a mini-workshop on an area-related project. Cindy is working on an exclusive design just for us! Lots from which to choose and many exclusive to them! How about a Boston skyline? Or an LL Bean Bag (just up the road in Maine) with a lobster? Or Santa flying over the capitol? Etc. 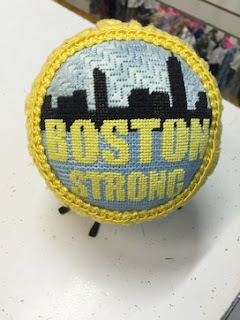 Boston Strong exclusive to Wellesley Needlepoint - can be with or without 'Strong"
After shopping and stitching, we jump back on the coach and head to Boston for our lunch at the unique "Cheers" Restaurant. Next - are you ready for this? 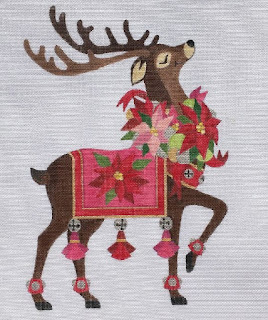 - we can venture over to our SECOND NEEDLEPOINT SHOP - Stitch Boutique of Boston. And wait until you see the colorful skyline, the cute little ducks, etc., etc., etc. We will order and pay for our kits ahead of time and pick them up at the shop! 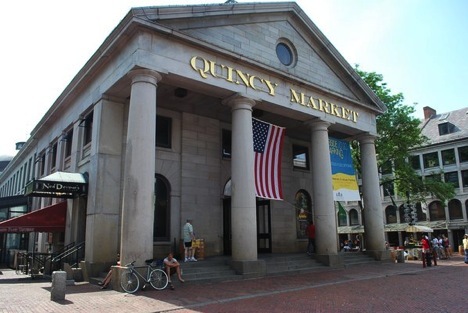 From this great shop we will venture forth and explore the famous Quincy Market! Looks like we can get into a lot of trouble there! 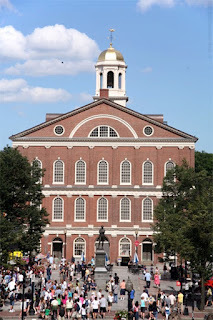 And then, we wonder over to Faneuil Hall. Debates anyone? We can shop on the first floor and argue - er debate - on the second floor. While taking in the whole Quincy Market area, we will have dinner on our own and at our leisure. But, wait - there is still more in store! Back at our hotel we will attend a PJ Party in our private Function Room. Remember pajama parties of your youth? Welllllll. At this event we will be have a class on an optional kit from Stitch Boutique of Boston that will be specific to the Boston area. Stay tuned for your choices. Day 3 we are up and at 'em for our Historic Tour of Boston - who knew? 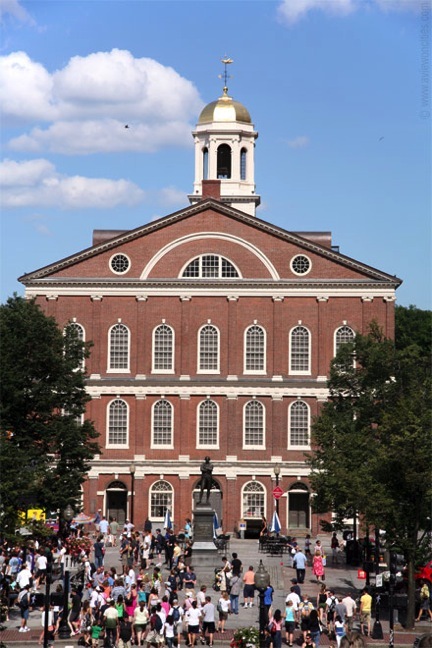 We'll blaze along parts of the Freedom Trail (is that Paul Revere's ghost in the bushes?) and absorb many of the Historic Sights our guide will share with us. We'll have a private tour of the Boston Tea Party Ships and Museum (by a Colonial character no less to create the feel of the period) and watch as the Boston Tea Party reenactment unfolds. Surely we're hungry by now so we will enjoy our lunch at the Tea Party Ships in Abigail's Tavern! Dinner Cruise aboard the Odyessy to enjoy a lovely three course dinner, live entertainment and view the wonderful skyline as we cruise Boston Harbor. Don't think we'll do much stitching after this adventure. Off and running next morning to the Cape Cod area. 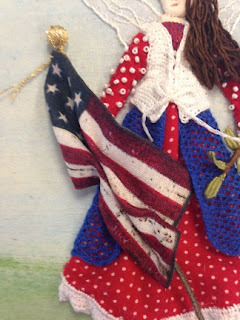 We will begin our full day of stitching for an optional class at Osterville Needlepoint Shop. Joyce has created an exclusive design for us to debut during our visit - a very colorful, happy beach scene - it is under wraps and we will reveal after it is stitched! And wait till you see what she has exclusively to her shop! We'll have lunch locally so we can get back to our class (lunch location to be announced later). After class we will go register at our hotel the Bayside Resort at Yarmouth, MA. We are in for a treat as our dinner will be at a unique restored Historic Home - known as Captain Howes House - which now contains the Optimist Cafe`. Read more details on the brochure. Next we return to the shop and participate in an optional mini-workshop! 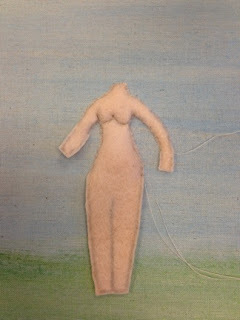 Joyce has something fun planned on this one working with one of the new and unusual 'threads'. Can't wait to see what she is having us do. Next day after breakfast we will return to the shop to have a stitch-in, catch up on project questions and maybe even shop (??? ha! ha! 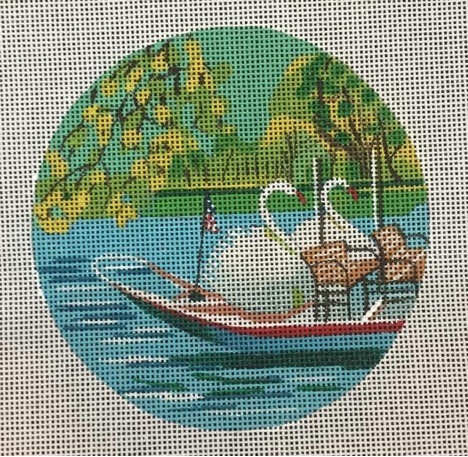 - we're in a needlepoint shop right? who cares that we already have 39 pair of scissor?) . We bid Joyce and the Osterville Needlepoint Shop farewell and head out to lunch . After lunch (location to be announced later), we will start to wind down and enjoy a leisure tour of the Hyannis area, see things like the John F. Kennedy Memorial, visit the Cape Cod National Seashore Visitor's Center, windmills and a lighthouse should we want to take some pictures. We return to our hotel and prepare for our Farewell Dinner - boo hoo! On our final morning we enjoy our breakfast and load up on our coach to go back to the airport and/or cars.